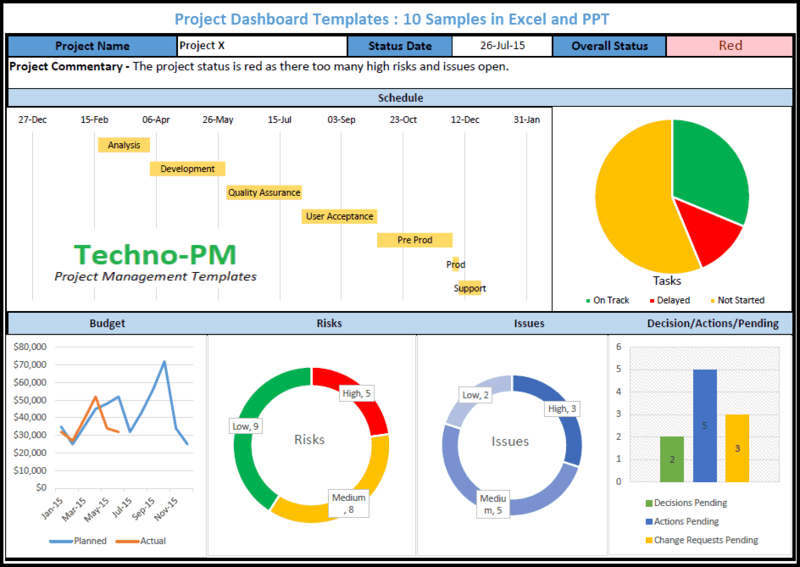 The dashboard template built in excel allows a project manager to provide an effective update on a portfolio of projects. The dashboard covers the project roadmap, project health, financials, resource allocation, and risk meter. 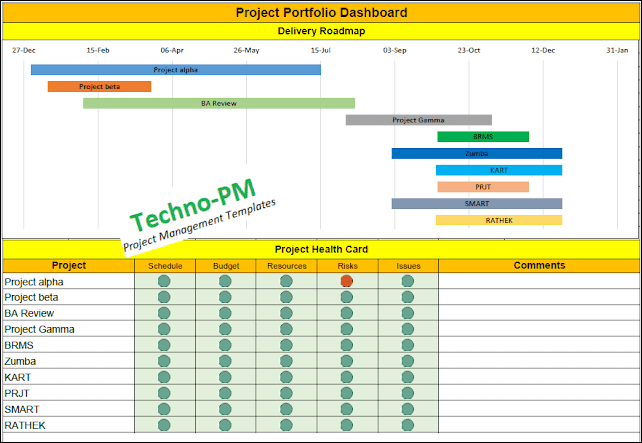 The project portfolio dashboard has project delivery road map, project health card, financials, resource allocation, project risk meter and other key parameters. 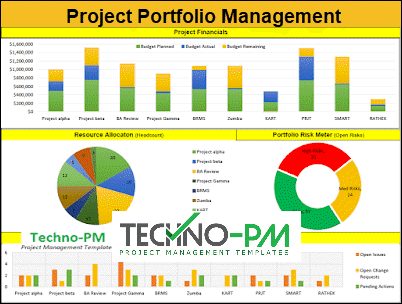 Can handle up to 10 projects and all the data for the projects is defined in a single tab. Easy to update project information. The timeline or road map can be expanded on collapsed as per the dates. You can use different colors for different projects to make it easy to visualize. The project health card covers key project parameters - Schedule, Budget, Resources, Risks and Issues. Changing the traffic light s very easy enter 1 for green, 2 for amber and 3 for red. Project Financials covers Planned Budget, Actual Budget and Remaining Budget. Resource Allocation gives an idea on how many resources are allocated to each project. Portfolio Risk Meter displays the open risks for high, medium and low severity. Other Key Projects Parameters include open issues, pending change requests and action items. The dashboard is simple to use and can be configured using the data tab. Each project can be set a start date and end date. Budget Planned, Actual, and Remaining can be set. Resource headcount is the number of people working on the project. Risks can be captured in terms of high, medium and low. 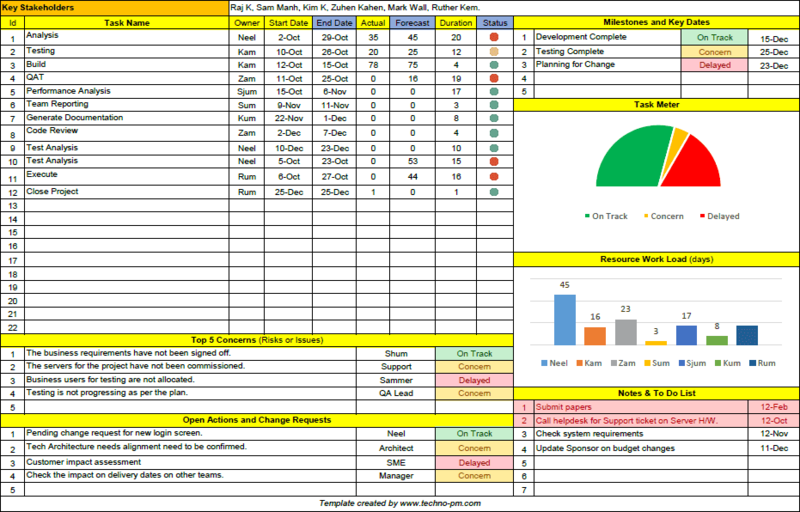 Lastly, no of issues, open change requests and pending actions. 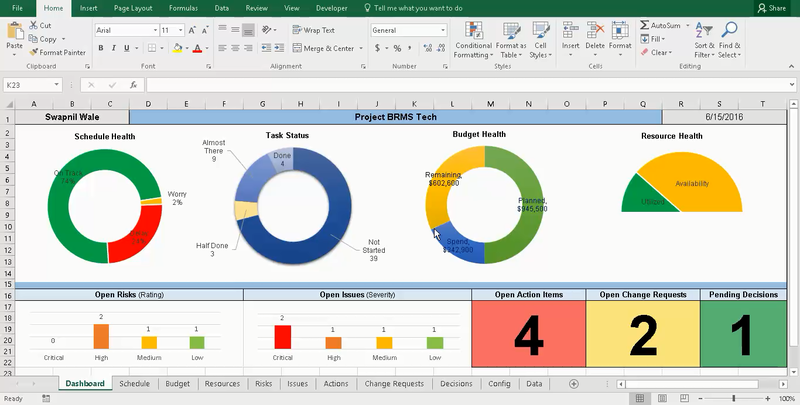 Consider the following - Project Management Dashboard Excel, Free Excel Project Management Templates, Portfolio Dashboard PPT, Excel Project Management Template. How do i make the dashboard adjust to the timeline of my project? In the data section there are start and end dates which drive the the first timeline. Also, this is a portfolio dashboard and not well suited for single projects. How do you quantify the risk? Are you following any model for that? I can't download the Project Portfolio Dashboard Excel template. Can you help me with what I may be doing wrong. after i enter in the start and end dates for each project, the timeline does not adjust under the delivery roadmap section. In fact, the months are no longer in order. It starts with dec 27 as in the picture above but then it odes to july 15, 31, jan. How can I fix that? Will have a look at get back ASAP. ok, I got a little further, your horizontal axis assumes a three year period for the delivery roadmap. is there a way to have it assume just one year? Hi Traci - Yes, there is. Can you please email me on swapnil@techno-pm.com?